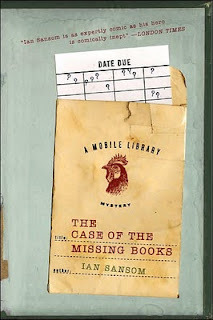 Last week I read the first in Ian Sansom's Mobile Library Mystery series, The Case of the Missing Books. I bought the first three books in the series (the fourth has just been released) because I thought it would be a sure fit for me. Israel Armstrong, a young London librarian down on his luck, finds an opportunity in Northern Ireland that he doesn't think he can pass up -- until he arrives and finds that the library has been closed and he is expected to operate a mobile library instead. Even worse, the books are nowhere to be found. And it also doesn't help that he is a socially awkward Jewish-Irish hybrid who is having trouble understanding the language and ways of the small town he finds himself in. I wanted to love this book but I didn't. Some of the characters grew on me by the end of the book but sadly the main character never did. And yet there was just enough in this book to make me curious enough to want to read the next one in the series. I need to see if Israel grows into a character that I will want to keep following through more mysteries. 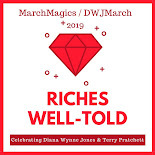 So I have decided to reserve judgment on the Mobile Library Mysteries until I have read at least one more book in the series. The reviews seem to get slightly better as the series progresses and I hope my opinion improves as well! Support our site and buy The Case of the Missing Books on Amazon or find it at your local library. We bought our own copy. I have this book on my shelf. I've wanted to read it for so long. You have made me want to pull it out. I enjoyed your review. I know you weren't completely happy with the book. Sometimes, doggonit, that happens. I didn't know this book belonged to a series. That really peaks my interest. Thanks for sharing. I also just read and reviewed this book. Oddly I've never heard of it, and now including mine in the past 10 days I've seen 3 or four reviews on it, including my own. I thought the book was okay, I enjoyed it as a satire of a mystery. But I found many of the characters hard to deal with at times, and Israel is definitely my least favourite. Oh dear ... I hate when books you think you'll love don't quite grab you. Tea - I would love to hear what you think of this after you read it! Jules - We totally felt the same way about the characters. Do you plan on trying any others in the series?